It’s not often that I read a somewhat serious children’s book that makes me laugh out loud. This book certainly does that, most surely due to the main character, a sharp, funny, sarcastic, and somewhat willful 13th century teenager. Her teenage outlook on life keeps this children’s book light, despite the fact that there are some fairly difficult family dynamics, especially a father who constantly uses physical abuse as discipline. One could hate the book for that reason alone. Yet, setting it in the 13th century somehow puts enough distance between us and the characters that the book doesn’t condone the abuse, but lets us see it for what it is–unacceptable behavior that hopefully is dying out in modern times. This is pure historical fiction, well-done, imaginative, and probably great for a school classroom or homeschooling environment. By the time I finished, I felt that this children’s book is more suited to an older classroom, perhaps 8th grade and up, because there are some ‘mature’ themes in here. The motif of a young girl betrothed against her will is a disturbing element of our past history, and could elicit terrific conversation. There are some very funny references to ‘saints’ throughout this diary, so anyone who is concerned about making fun of the church might need to preview the book first. I personally found the saint references at times distracting, and at other times another source of laughter, as they are all done tongue-in-cheek. This book is not for straight-laced, serious-minded historians. It’s a book to simply enjoy! 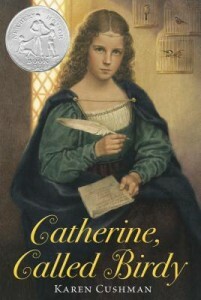 A Newbery Honor winner.